Right next to KOUREMENO'S beach, 2km from Palekastro village and 4 km away from the famous VAI palm forest, we built GALINI apartments with comfortable and spacious rooms (Studios & Apartments) for 2-5 persons. A hospitable and quiet place with low prices. 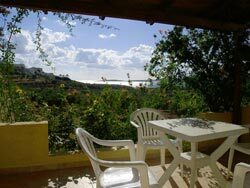 All the apartments are fully equipped with beautifull sea view, kitchen, bathroom, tv, air contidion, private balconies. GALINI apartments is rounded by garden and it also has space for parking. You can enjoy your swim at the marvellous beaches of the area, to pay a visit to the old town of ERIMOUPOLIS and the very old chapel of virgin Mary at MONI TOPLOU, to walk to the palm forest of VAI, to enjoy a meal of fresh fish at the taverns of KOUREMENO'S and HIONAS bay and to do your shopping at the traditional village of PALAIKASTRO, which is only 3km away. We are open both in the summer and in the winter. Enjoy your vacation in a friendly environment, guaranteed by the managers EFI and GEORGE BOYTIRAKI.